Thats not to say there haven't been advances in the field of patio furniture design (and if you have a pool there are some great pool cleaning robots available! There's even some that will mow your lawn). 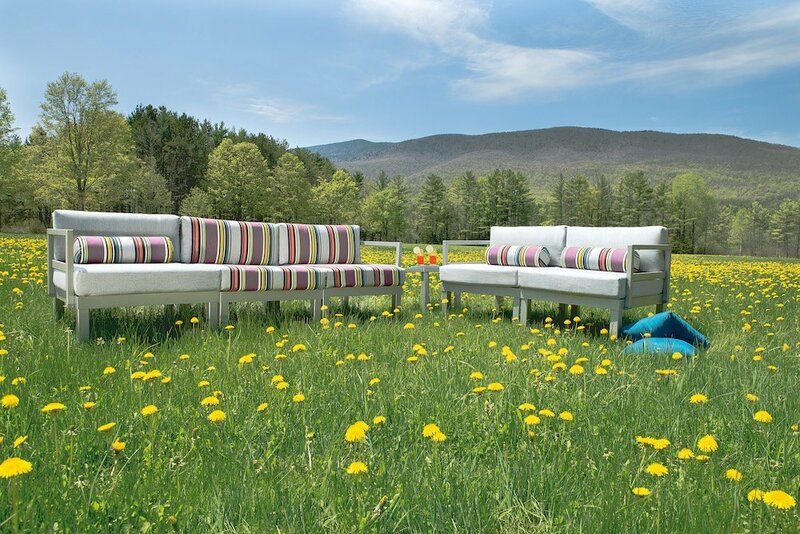 Patio-lovers looking for low-maintenance set-up are frequently opting for vinyl strap furniture, choosing vinyl webbing for patio chairs, sofas and chaise lounges. While cushion-covered patio furniture remains a comfortable, stylish and timeless choice, cushion-covered garden sets will need a degree of protecting from the elements, vinyl webbing for chairs is far hardier, enduring in rain, wind, sunshine and snow. Vinyl webbing is rust-proof, durable, heat-resistant and versatile. And while it's easier to care for than cushions, vinyl webbing will still require a little TLC from time to time. Even the tidiest, well-kept patio garden will be prone to pollen, which, together with dust, can create a greasy, unappealing film over your furniture. To clean light layers of this off of your vinyl strap furniture, trying using a damp cloth. Tackling heavier grime? Try a mild solution made of warm water and dishwashing soap. If the stains persist, mix in one or two tablespoons of bleach to a half-gallon of the soapy solution. Apply to your vinyl webbing furniture and rinse well. 3. Unlike people chairs shouldn't wear sunscreen! Encourage your family and visitors to use towels if they're sunbathing or swimming. Protecting your vinyl webbing from everyday abrasives like suntan oil and swimming pool chlorine will help to double its longevity. Still scrubbing away? Try increasing the strength of the bleach. If a 50/50 mix of bleach and soapy water doesn't work, it's very likely you'll need replace the straps. Trust us this option is easier, safer and far more practical than painting your vinyl strapping furniture. Just one bad irremovable stain, or one broken strap? Don't chuck out your chair. Heres a handy set of tutorials on how to swap that sucker for a shiny new vinyl strap yourself using our pre cut straps.